I've got a little beauty review for you all featuring MeMeMe Cosmetics which etailPR kindly sent to me. I first came across this brand whilst I was subscribed to Glossybox. Wow, it's been a long time since I thought about those, but I still use the highlighter that I received from there. This time I'm trying out a few eye products and a Lip Pen. First thoughts are what cute packaging. I love anything that comes in a small box. Unfortunately, I was far to excited and didn't manage to take a photo of the box they came in (forgive me) but trust me, if packaging is your thing, MeMeMe Cosmetics will satisfy you. Lets start with the Enchanted Eyes Dual Eye Wand in Woodland Smoke. This is a double-ended pencil, one side has a metallic brown tinge and the other is more silver/black. I simply add this straight to my eye and blend using a pencil brush, as other brushes can be too soft. 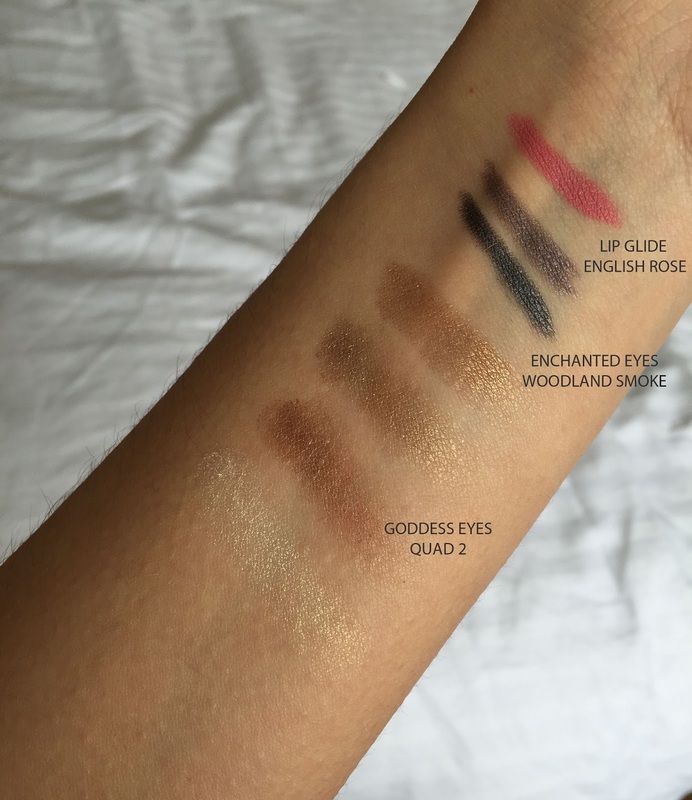 I am obsessed with the Goddess Eyes Quad 2 as it is perfect for that glam look. All four colours look great together, but they are also great alone. I love using the lightest colour as a highlighter in the inner corners of my eyes. Finally coming to the Lip Glide in English Rose. This colour is a great Soar lip liner dupe. This will definitely be my everyday lip colour as the pencil is so easy to glide over your lips leaving you with a soft velvety finish. If you would like to try these products or anything else from the MeMeMe website I've got a 20% off code for you all, simply type 'TERALME3' at checkout.